Established over 12 years ago you're in good hands with Ignition Driving School. We've helped over 1000 pupils pass their driving test in just the last 5 years alone and we have a highly experienced, fully qualified, female driving instructor, helping pupils of all abilities, learn to drive in and around the Bromsgrove area. You will also benefit from Ignition Driving School's additional support, including FREE driving lesson aids and FREE theory papers, to help you throughout your course of Bromsgrove driving lessons. 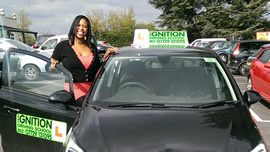 Indeed Ignition Driving School has everything you need to help you learn to drive in Bromsgrove. We offer all types of driving tuition courses from weekly, hourly driving lessons to motorway driving lessons and we are very experienced in running intensive driving courses in Bromsgrove too, with over 350 pupil passes. With an intensive driving course it is possible to get up to driving test standard much quicker and so may be of interest to you if time is of the essence. Prices on these courses start from as little as £310 and include a driving test and 10 hours of driving lessons. I had been trying to pass my test on an off for many years. I was a very anxious driver at the beginning but Milly was lovely and put me at ease right away. She made me believe in myself and my driving ability. I ended up passing my test 1st time which I am sure I would never have done without her guidance. Thanks so much Milly for everything! To get started simply click on the Quick Link tabs below. We look forward to teaching you soon.